MinorMonitor's dashboard provides a neat overview of your child's Facebook activity, including an hourly breakdown of their usage. Like SocialShield, MinorMonitor is a completely Web-based product; rival SocialGuard is a downloadable application for Windows PCs. And while MinorMonitor and SocialGuard are specific to Facebook, the pricier SocialShield covers additional social networks such as Twitter, MySpace, and FormSpring. Despite those differences, each service tackles Facebook protection in a similar way. None of these is a covert solution: all need your child's login information in order to get started. Once installed, they scan incoming and outgoing messages (both public and private) for potentially troublesome material. And all alert you to potentially dangerous friends, based on their stated age as well as the number of common friends. In all of these aspects, MinorMonitor performed just as well as the paid solutions. It delivered timely alerts on posts containing profanity, references to alcohol, possible bullying terms, and more. Like all of the services, MinorMonitor delivered plenty of false positives--alerting me to the word "chocolate," for example, because it is considered a "possible drugs reference." But when it comes to the safety of your children, it's definitely better to get more info, rather than less. And you can dismiss any alerts you don't want to receive. Unlike Social Guard, MinorMonitor does not allow you to customize the list of terms to which it will alert you. SocialShield's list of terms is not customizable, either. But MinorMonitor does allow you to choose which categories you'd like the app to alert you on, such as profanity, sexual reference, drug reference, or others. That way, you can let your older children swear to their heart's content, but still be alerted to any talk of drugs. MinorMonitor presents its alerts in an easy-to-understand dashboard that offers plenty of details on your child's Facebook activity. You can see what times of day they're using Facebook frequently, which can let you know if your child is chatting online when they're claiming to be studying. The service also lists all of your child's Facebook activity, such as all posts, comments, and photos posted. This can be a little overwhelming, especially if you're dealing with an active Facebooker. The Friends list also contains all of your child's friends, not just those that contain alerts. If your child has hundreds and hundreds of friends, sorting through them can be time consuming. It would be nice if MinorMonitor let you scan through just those friends you might want to look at more closely. 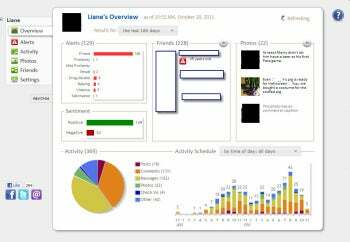 Still, MinorMonitor offers a comprehensive overview of your child's Facebook activity. And it's free. There's a lot to like here. SocialShield offers a pricey but complete way to keep children safe across multiple social networks. MinorMonitor offers a free and comprehensive way to keep kids safe on Facebook.